Russ and Jono bring their unique brand of comedy to the radio waves! 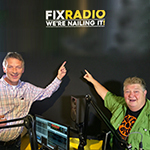 Appealing to a massive audience of plumbers, builders, roofers, tradies and labourers of all stripes, Russ and Jono couldn’t resist coming back, and rebooting their show for a chance to truly nail it once again! Be sure not to pass the opportunity up to discover or rediscover this distinct comedic duo! Tune in 8AM every morning to give yourself a grin to start the day with.